Diabetes affects more than twenty million Americans each year. While it is a disease that is ongoing and lasts a lifetime, many people, namely those that have Type 2 diabetes are completely unaware that they even have the disease in the first place. The symptoms to be aware of are issues with weight loss, fatigue, blurred vision, hunger, excessive thirst, numerous trips to the bathroom, and hunger. As in the matter of type 1 diabetes, the most prevailing symptoms that make up this disease are characterised by continued loss of weight even with an increase in appetite, nausea, acceleration in thirst, vomiting, urination on a more frequent than normal basis, and fatigue. Because type 1 diabetes is a disease that builds very slowly over the course of time, it is many times only found when the patient develops symptoms that require an emergency room visit. Type 2 diabetes is somewhat more difficult to identify in people that are carrying the disease because in many situations, those who actually have it are not even aware that they have it. Unlike type 1 diabetes, this category of diabetes is one the evolves much slower and those that are with a higher level of blood sure exhibit and suffer no symptomatic effects what so ever. This is not to say that there aren’t symptoms or signs to watch for that may indicate further investigation. People who experience an increase in visits to the bathroom for urination, experience blurred vision, find themselves easily fatigued or fatigued on an ongoing basis, find themselves more frequently thirsty or even hungrier than usual may want to consider getting themselves tested for the possibility of type 2 diabetes or diabetes in general. So, as we’ve discovered, a large population of Americans are affected by this debilitating, and chronic disease and in many situations, many people are carrying on with their day to day lives obliquely unaware that they have the disease and likely not likely to find out that they have it unless for some reason emergency treatment for a sudden health concern arises. So, be aware of your body! Through the understanding of the fundamentals of the human digestive system, we can begin to explore the causes and the symptoms that characterize the chronic disease known as diabetes. This is a permanent problem that affects as much as 20 million Americans a year and the efforts to fight back and eliminate this problem are ongoing. After an ingested meal, the proteins, calories and fats are reduced to a type of sugar, the so called glucose, which provides the nutrition and energy required by the body. It then enters into the bloodstream where it is then distributed throughout the body. This movement is achieved through the aid of a very important organ, called the pancreas. The pancreas produces the insulin needed to transport the glucose to the various components of the human physiology where it is converted to fuel and utilized in muscle, the liver and the cells. To summarize the purpose of this insulin created by the pancreas: it is a hormone that helps to regulate the sugar contained in the blood. Diabetes is typified by the presence of higher than normal levels of sugar in the blood at any one time. The root causes of diabetic symptoms is the inability of liver cells, of fat and/or muscle to interact well with the insulin produced by the pancreas or the failure of the pancreas to produce enough of the insulin required to ensure adequacy of the digestive system. In some cases, both of these elements of diabetes are present. Know your enemy. 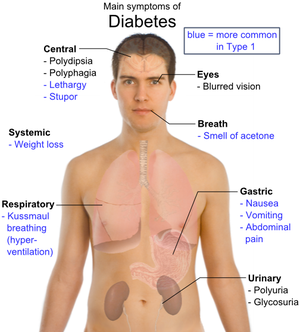 There are varying forms of major diabetes and they are, Type 1 & 2 diabetes, and gestational diabetes. Now Type 1 is a diabetes form that is mostly found in children in which the production of insulin is either minimal or not present at all and the necessity of injections on a daily basis is required. Although a lot of people older than the ages of twenty are found to have this disease. Although autoimmune issues, viruses and genetics may have some relevance in the evolution of diabetes in the individual, the actual cause is not yet known. Type 2 diabetes is a form that is one that is found in the majority of diagnoses, and while it is commonly identified in adults, is known to affect younger people as well. This is primarily owing to the failure of the body to relate positively with the insulin made but as well it can be caused by poor exercise and diet. Gestational diabetes, finally, occurs at random times for non diabetic women who are at different stages in pregnancy and the effects of this particular form of diabetes can have longer lasting effects such as cardiovascular disease or type 2 diabetes at a later date in their lives. Diabetes can and often does go undiagnosed because the symptoms can seem harmless and oftentimes normal. Gestational diabetes is a form of diabetes that occurs during the second half of pregnancy.Although gestational diabetes typically goes away after delivery of the baby. Women who have gestational diabetes are more likely than other women to develop type 2 diabetes later in life. Pre diabetes is a condition wherein no physical symptoms are seen although you are predisposed to having diabetes because of the risk factors that are present like having a history of diabetes in the family, age, sedentary lifestyle, obesity, insulin resistance, smoking, alcoholic abuse and an unhealthy lifestyle. Type 1 diabetes is typically recognized in childhood or adolescence. It used to be known as juvenile-onset diabetes or insulin-dependent diabetes mellitus. However, high blood sugar is not something you can see in the mirror at home, so it is useful to know the side – effects of high blood sugar, which are commonly recognized as the noticeable symptoms of diabetes. The pancreas secretes insulin, but the body is partially or completely unable to use the insulin. This is sometimes referred to as insulin resistance. The body tries to overcome this resistance by secreting more and more insulin. People with insulin resistance develop type 2 diabetes when they do not continue to secrete enough insulin to cope with the higher demands. If you have one or more of these diabetes symptoms, see your doctor right away. You can also take our Online Diabetes Risk Test to find out if you are at risk for diabetes.